The Stainless Steel Bolo Machete follows a sturdy design that originated in the Philippines. Its ability to chop through tough materials has earned it worldwide popularity. It is definitely a handy addition to your survival gear. Crafted from stainless steel, the blade bulges slightly at the end, which increases its weight and strength. It is slightly thicker than the traditional machete since its original purpose was for harvesting crops and clearing thick vegetation. Textured black ABS plastic covers the grip of the full tang blade. Two lanyard holes appear at the pointed tips of the tang. 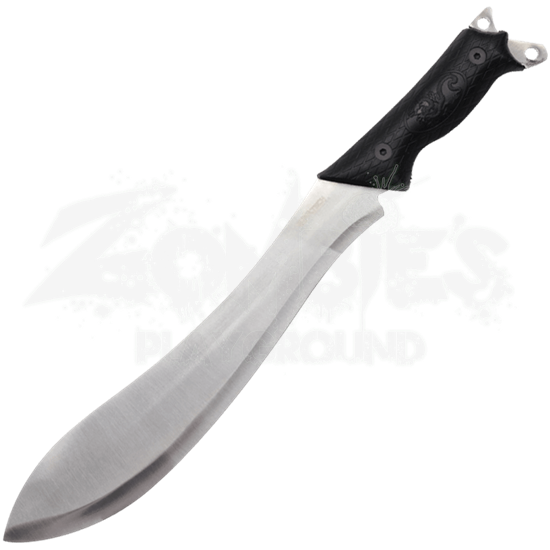 No matter where the outdoor adventure leads, the survivalist is sure to make good use of the Stainless Steel Bolo Machete.